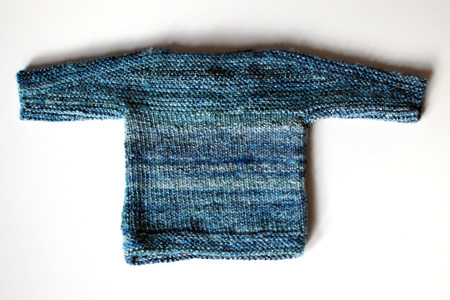 Pattern: Petite Facile Pullover by Meghan Jones from the Winter 2011 Interweave Knits. I knit the smallest size, 3 months, to fit a baby born this winter. Super clever construction. A little garter stitch, a little stockinette, knit in one piece with just a few seams to put it together. Love the short row technique to shape the sleeves, as well as the offset sleeve seam. I knit this without a single modification, but I think if I knit this again, I would lower the front neckline a little bit. I think the sweater is going to ride up over the chin the way it currently is. A few short rows in the front would make a nice curve, and match the sleeve short rows in the back! Yarn: superwash merino 3-ply handspun from Pigeonroof Studios, squall colorway. This is my first time using a 3-ply handspun yarn, and it’s very different than 2-ply. It’s rounder and denser, and creates a fabric that’s perfect for outerwear. One of the skeins I had was a bit unbalanced, so the front stockinette panel biases, but overall this was a lovely yarn with a beautiful denim look. The sweater used up about 220 yards, I’d say. Needles, gauge, and finished dimensions: US 7 addi Turbo needles gave me a gauge of about 4.5 stitches and 7.5 rows per inch in stockinette. The sweater measures 18″ around the torso, 10.5″ from shoulder to hem, and 5.75″ from armpit to cuff. Ever since having a baby, I’ve become keenly aware that I roll up shirt and sweater sleeves 95% of the time. I now tend to knit sweater sleeves shorter than patterns specify. But I didn’t change this pattern – 5.75″ armpit to cuff for a 3-month size is pretty good! The standard is 6″, and I’ve seen sleeves as long as 7″ for this size! 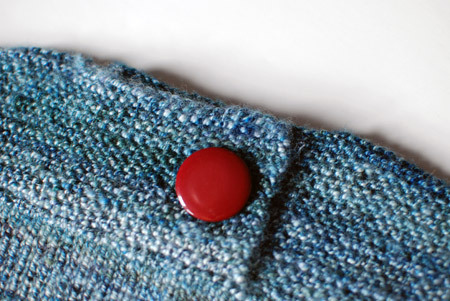 Lastly, the finishing touch is a pretty shank button I picked up at Gather Here – love that shop! My baby boy is 7 months old today, and he wishes all of you a wonderful week! The yarn-button combination is fabulous! Cute sweater! I would agree with you about the rolling up of sleeves – babies only really have arms that are as long as their heads are tall. (It makes them look so cute when they stretch their arms up and their hands only just reach up to the top of their heads.) I guess babies’ clothes designers regularly forget this, and that is why the sleeves are too long? I love the baby pic, my 2nd is just a few weeks older than yours. Thanks for sharing him with us! He is just so adorable. His smile can always make anyone smile when they see his picture! & months old and handsome as ever. And a happy New Year for all you 3 ! I see that Grégory is the happy owner of Sophie the giraffe, a 50years old gum toy, which was (and still is) the must for million of children ! Thanks to let us see him growing. That picture of your little one is SO CUTE! 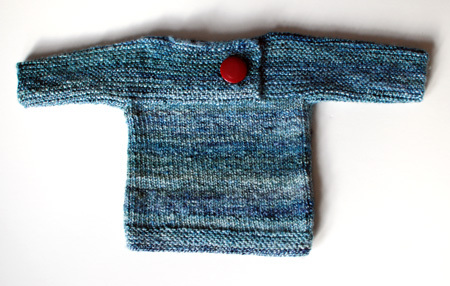 If I remember correctly, Elizabeth Zimmerman herself suggested 3/4 length sleeves for baby sweaters (true for the baby surprise sweater, I believe) for the very reasons you mentioned. Fantastic picture of an adorable, happy baby! Every time we see him, he is even cuter! The sweater is cute too, of course, but not nearly as cute as the boy! Your baby has such a contageous smile! The little pullover is super cute! The sweater is beautiful and the baby adorable. So I’m slowly scrolling down, oohing and aahing over the sweater, already thinking of my comment of how deliciously cute it is, and then—THEN, all thoughts of the sweater evaporate as I gaze at your **adorable** son. i just knit this! i will blog it very soon! I think your little guy has cornered the market on ‘cute’ because he is just incredibly adorable! Love the new little sweater and appreciate your alteration ideas. I’ve got a new grandbaby on the way and might want to try this pattern. So many sweet possibilities out there. Thanks for bringing this one to light. Is that baby adorable or what!!! That is a super cute sweater (and an even cuter little boy)! Is it possible that some designers are making the sleeves so long so that the little hands can have a bit more warmth considering it is so hard to keep mittens (and booties/socks) on such busy hands and feet? every picture of your baby is such a delight. He is clearly very happy, which says much about your parenting(in a good way!) Good job Mama! Another adorable baby picture. He looks so big in this one…they grow so fast! He is just the cutest little boy EVER! And look at those little pudgy, dimpled fingers! Sweater’s pretty cute, too. Love the sweater – – but love the little boy so much better!! He is getting so big – – sitting straight and ready for play!! Gregory has to be the happiest baby ever! Not a single grumpy bone in that kid’s body! Congratulations to you and Mr Sweetyness on your wedding anniversary just past this week. Tried to comment on previous post but the comments were closed. Your baby boy has a smile that makes me want to laugh. He looks soooo happy!